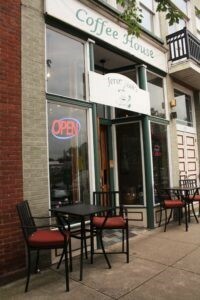 ﻿ Jeremiahs Coffee House - Ohio. Find It Here. 3 by blood, and 2 bonus by coffee, came together with the idea to open a rad place to enjoy coffee, take in the beauty of downtown Marietta, and add a little pep to the step of our historic downtown. We come together to make our community a great place, and offer a superb cup of coffee. Not to mention an atmosphere to make you feel at home, like you just want to prop your feet up on the table and spend some time with friends. Let us show you that #thisiswhatawesometasteslike !